The swiss-only dial is perfect with a nice creamy patina and all lume dots intact. The steel case appears to be unpolished and measures 36mm excl. original unsigned crown with a lugwidth of 18mm. 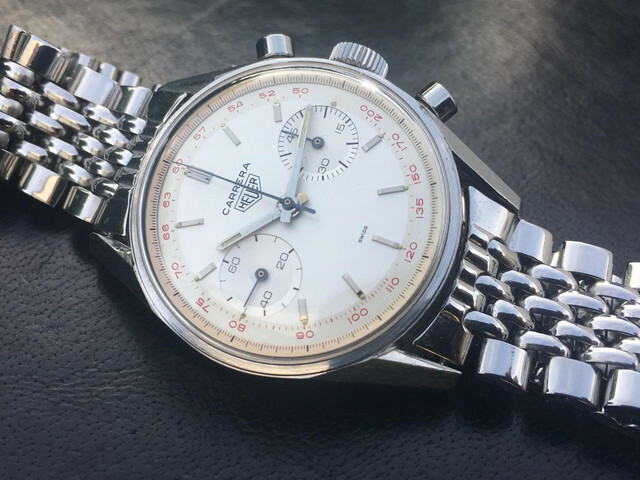 Timekeeping is very good and the chrono resets to '0' as it should, this watch was recently serviced by a professional watchmaker. The watch comes on an unsigned Beads of Rice bracelet with 18mm endlinks, but can also be bought head-only. Price: $7700 with BoR bracelet. The price includes shipping anywhere in the world.